During this year’s Geneva Days, Hublot revealed a range of jaw-dropping novelties. There is the Hublot Big Bang Paraiba, for example, the first ever watch that is decorated with a cuprian elbaite. The Paraíba Tourmaline is of vibrant, intense colours and a stone that is so rare that for every 10,000 diamonds only one of it is mined. But the watch that truly caught my eye is the Classic Fusion Aerofusion Chronograph Orlinski. I am a huge fan of Richard’s work which is probably why. I love his colourful, graphic universe and this watch brings it beautifully to life. A true object of desire! Hublot loves Art and, like many of its brand ambassadors, regularly pushes the boundaries of the imaginable. Richard Orlinski is the contemporary French artist that is probably the most en vogue right now. 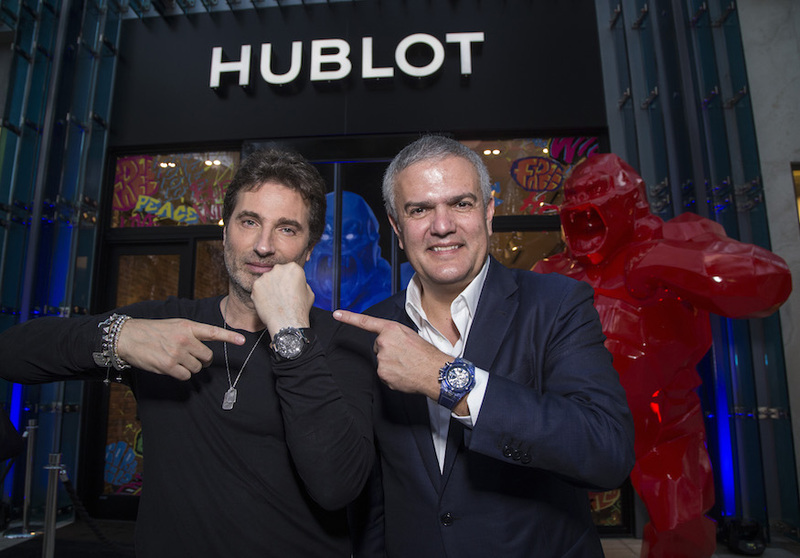 He joins the Hublot family alongside other famous names including Maxime Büchi, Lapo Elkann, Pelé, Lang Lang, Bar Refaeli, Usain Bolt and Dustin Johnson. The watch features a brand-new design playing with angles and reflections. Ridges and facets on the watch reflect each other, from the case to the bezel, and from the push buttons to the hands. 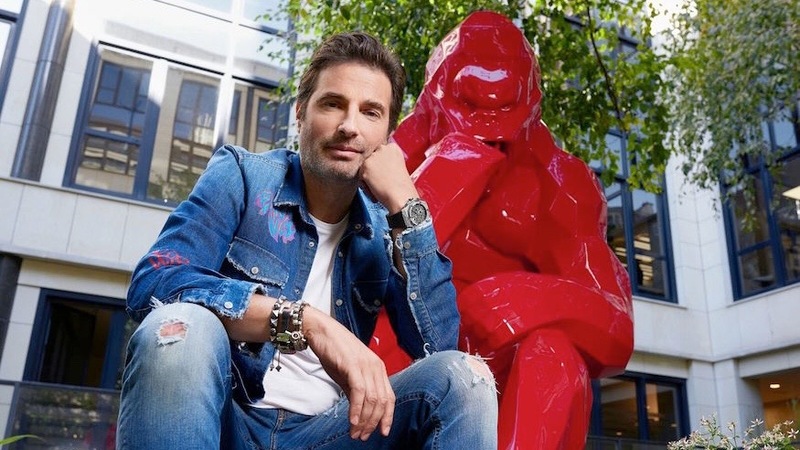 “The fusion of our two universes – that of Hublot who takes precious materials to create exceptional products, and my own bright world of colour inspired by Pop Art – came about quite spontaneously, almost naturally”, says Richard Orlinski about his collaboration with the Swiss watchmaker. It is quite likely that you have already seen Richard Orlinski’s Pop Art-style creatures somewhere. Right now – and until the end of March – there is an ephemeral exhibition with a small selection of his art at “La Petite Foret” by Grand Hotel Kempinski in Geneva. Other references are his immense “Wild Kong” gorilla sculpture on the Croisette in Cannes and his crocodiles in the sunshine of the Miami Design District or his 5-metre-tall bear on the snowy pistes of Courchevel. Richard creates his sculptures by cutting them like diamonds and he never fails to rise to a challenge. In the hands of Richard Orlinski, the Classic Fusion Aerofusion Chronograph is adorned with its iconic facets, 12 of course, like those that punctuate the dial of a watch. As one who appreciates exceptional expertise, the artist has designed a watch on the frontier of vintage and neo-futurist styles, just like his works inspired by the Pop Art movement. Pointing to the future, the hand of the watch becomes a symbolic metaphor for Richard Orlinski: as it never stops turning, it embodies infinity. The Classic Fusion Aerofusion Chronograph Orlinski is available in two brand-new models, each released in a limited edition of 200 pieces: one in titanium and the other in blue ceramic. The watch becomes a 45- mm work of art designed to be worn on the wrist. The Hublot x Richard Orlinski watch’s dial has been cast in sapphire crystal, while the case, crown, bezel and push buttons also feature the facets. The visionary design of Richard Orlinski presented a major challenge for the Hublot Manufacture: the work of Richard Orlinski – a three-dimensional fold in the case – had to be modelled before it was cut from ceramic and titanium. These two materials feature one of the artist’s iconic signatures: mirror polishing. In 2004, at the age of 38, Richard Orlinski decided to dedicate himself fully to art. Inspired by nature’s wildest animals, Richard Orlinski enjoys creating his monumental, brightly coloured sculptures of beasts, bringing them to life in the most unexpected places. From the peak of the slopes in Courchevel to our TV screens, and in open-air exhibitions from Paris to the provinces, the artist loves being where people least expect! Through his “Born Wild” concept, Richard Orlinski is trying to turn the animal’s negative impulses into a positive emotion. Immersed in the Pop Art culture, the artist revisits the iconic objects which have inspired countless generations. Richard Orlinski mainly likes to work with contemporary materials such as resin and aluminium, but also uses bronze and stone. Nothing stops this visual artist when it comes to creating! Curious by nature, Richard Orlinski loves expressing his artistic sensibility in various fields: Sculpture, design, music… he likes to reach as many people as possible and, above all, provoke an immediate reaction! Since 2015, Richard Orlinski has risen to the top of the ranks of the world’s bestselling contemporary French artists. (Source Art Price).